The Xinjiang Qitai 110-meter Radio Telescope — QTT, for short — could help advance research on dark matter, gravitational waves, and extraterrestrial intelligence. China has announced plans to build the largest steerable radio telescope in the world, the Xinjiang Qitai 110-meter Radio Telescope (QTT), which could provide a huge boost to the search for dark matter, gravitational waves, and extraterrestrial intelligence. 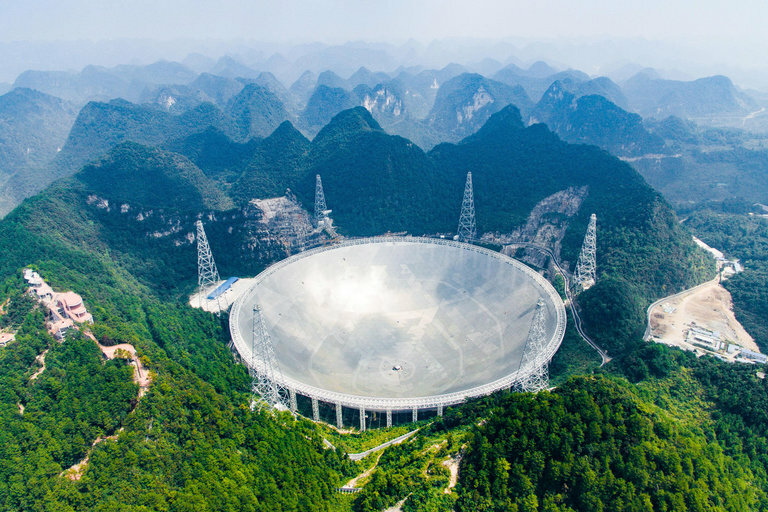 China is already the home to the world's largest radio telescope. The FAST, or Five-hundred-meter Aperture Spherical radio Telescope, has been in operation since 2016 and was built in a natural depression in the landscape, similar to the famous Arecibo Telescope in Puerto Rico, and therefore is primarily a fixed position dish. It has, however, a novel, “active surface” design, where metal panels on the surface can be tilted to change the focus to different areas of the sky. Vakoch said QTT, proposed to be built in the Xinjiang autonomous region of northwest China, will have a slightly larger aperture than the two largest, fully steerable radio telescopes currently in operation. The Robert C. Byrd Green Bank Telescope (GBT) located in Green Bank, West Virginia is currently the largest steerable radio telescope, with an elliptical dish that’s 100 meters by 110 meters. Germany’s Effelsberg dish is 100 meters in diameter. As far as searching for extraterrestrial intelligence, Vakoch said QTT will accelerate the search for life beyond Earth in two critical ways. The objects most widely associated with the search for extraterrestrial life, or SETI, are signals from another civilization. By outfitting the QTT with the signal processing capabilities to search for these artificial signals, Vakoch added, astronomers will be able to scan the heavens for signals that could only by created by advanced civilizations. Strategies to foster international cooperation for super-computing capability to sift through a massive amount of cosmic static are in the works, he said. That may be the biggest outstanding question about the project: How sure are scientists that China will follow through on their plans for QTT? It took 20 years after it was first proposed for FAST to be built. Vakoch said there’s never a guarantee that any large-scale telescope project will be completed, and history is full of examples of long delays and budget overruns. But he’s very optimistic about QTT’s future, with China’s history of completing milestones in astronomy, as well as human and robotic space exploration. WATCH: What Can Giant Telescopes Reveal About Our Universe?